Photo: Robert McNair for Sunoptic. Mary Ma's Wind Water Wave is a 50 foot long polyester fabric that cascades from the ceiling. This fabric is blown by high powered fans, causing a continuous series of waves that ripple to the ground. 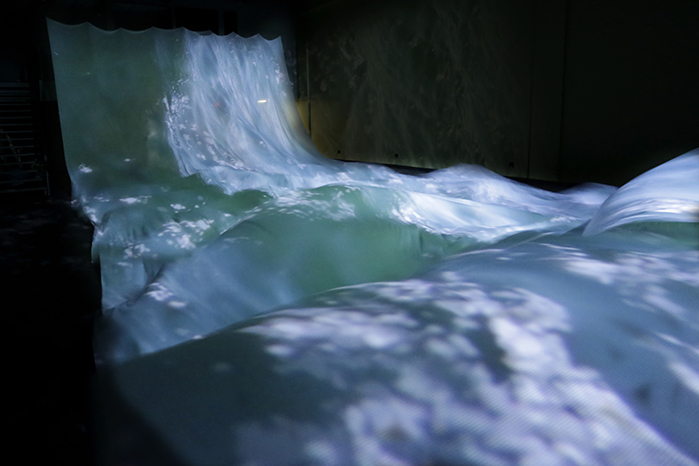 Video projectors mounted in the ceiliing light up the fabric with the imagery of moving water recorded on the shore of Lake Ontario. Wind Water Wave was created and installed at 260 King Street West in Kitchener over the month of May 2016 and opened on May 28 for CAFKA.16. I first encountered Mary Ma through her student profile on the OCADU Blog, “The Learning Zone.” Because of CAFKA’s long association with Christie Digital, I was always on the lookout for artists doing interesting things with projection technologies. I was impressed by the maturity of the work illustrated in the blog post and I quickly decided that I wanted to meet her. I found out that she would be showing new work at the OCADU year-end exhibition and made arrangements to go and meet her. At her OCADU graduation show, Mary presented a new work she called The Wave. The Wave continued her use of shaped projection surfaces and multiple projectors to represent continuous images of water or sky. The screen wrapped around two walls allowing the viewer to walk up to the piece and feel enveloped by the water – an immersive experience that she was able to explore in Wind Water Wave. Closer inspection behind the scenes showed the artist’s genius for improvisation. Three desktop projectors were balanced on a shelf on the wall. Each projector had tinfoil taped to the sides of the lenses to blend the edges of the image and create a larger continuous image that wrapped around the two sides of the screen. Right: Photo by Mary Ma; Left: Photoshop rendering by Mary Ma. I invited Mary to come to Kitchener for a tour of the Christie facility and to discuss the development of a project for CAFKA.16. I asked her if she had a large project that she wanted to do and she presented me with Wind Water Wave, a plan for a massive outdoor installation. She wanted to project video images of water onto a large piece of fabric that was being blown by electric fans. After some consideration, we decided that weather factors made the control of 20 metres of polyester fabric outdoors close to impossible, and we began to consider possible indoor adapations of the project. We were very fortunate that Bernie Nimer offered us the use of an unoccupied former theatre space on the second floor of his property at 260 King Street West in Kitchener. Left: Photo by Gordon Hatt; Right: Sketch-Up diagram by Ji Luo. The artist sourced a white, light-weight polyester fabric in four foot wide bolts. It would be necessary to sew six lengths of fabric together sie to side to create a cloth 24 feet wide by 60 feet long. To do that we organized a sewing marathion. After the lengths of cloth were sewn together, Mary took the fabric home and trimmed and steam ironed the seams to make them as invisible as possible. Left: Photo by Mary Ma; Right: Photo by Sarah Goldrup. Tests were undertaken to determine the amount of wind force necessary to move the cloth in the most appropriate fashion. Mary set up tests with small pieces of cloth and a simple window fan. We also faced challenges covering the fabric with the video image. Calculations were made to find the optimal placement for the Christie Boxer projectors. Even with optimal placement of the projectors, image area would be about six feet short. Left: Sketch-Up diagram by Jordan Priede. Right: Photo by Robert McNair for Sunoptic. CAFKA volunteer Mike Ambedian spent a number of evenings getting the the fabric to hang just right from the open trusswork of the ceiling. High powered fans were used to test the movement of the cloth. Sherwood Systems mounted the Christie projectors from the trusswork at the other end of the room. The first full test run showed the powerfully intoxicating effect of the combination of the video on the moving fabric. But we still had the problem of full image coverage. The video didn't reach the last two metres of fabric. I quickly grabbed a Christie lens case and a chair and used them to tuck and tack the ends of the cloth. The result was a large billowing wave at the end of the fabric, large enough for people to sit under. Later, we cleaned this up and replaced the ad hoc weights with a couple lengths of steel pipe. The wave however became a popular place to experience Wind Water Wave as an immersive artwork. It is difficult to describe the hypnotic character of Wind Water Wave without comparing it to sitting on a beach and watching the waves. The repetetive rhythmic quality of the flowing fabric and the dance and sparkle of the light of the water images were equally as transfixing. From below, the experience of sitting under the work and being immersed looked uncannily like being under water. There was a remarkable symbiosis between the image of transluscent water and the transluscent polyester fabric. The mechanics of the illusion were readily apparent, but like an Impressionist painting, where even though the thick taches of paint and brushwork are plain to see, we readily give ourselves over to the illusion that these are clouds and this is sky and this is water. And what is the "it" we give ourselves over to? What is the actual illusion? It is the ceaseless array of shapes and light and colour in movement - drawing us in, rushing toward us, folding around us. Toronto, based Mary Ma received her BFA in Sculpture and Installation from OCAD University (2015). In 2014 she attended the Pacific Northwest College of Art in Portland, OR as part of the AICAD Exchange Program. Her first solo exhibition “A Fully Developed Sea” took place in 2015 at the Katharine Mulherin Contemporary Art Projects, No Foundation Gallery, Toronto. For more work by Mary Ma, visit her web site at http://www.maryma.ca. Mary Ma's Wind Water Wave was curated and produced by CAFKA. Photos by Robert McNair for Sunoptic. Thank you to Jordan Priede for technical support. Thank you to volunteers Mike Ambedian for his days and evenings of installation work, and Linda Janzen, Zoe Janzen and Shannon Figuereo for helping to sew the fabric. Thank you to Sam Boucher-Hatt for set up and support. Thank you to Sarah Goldrup, Frank Seglenieks, Samantha Mellick, Maria Chowdhury, Shantal Myers, Kristina Foster, Ioana Dragomir and Sam Boucher-Hatt for security support. Many, many thanks to Bernie Nimer for allowing us to use his space at 260 King Street West.